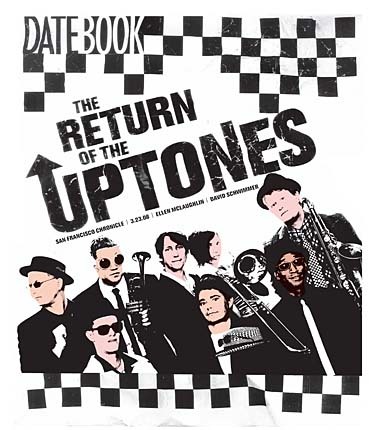 When SF Chronicle pop music critic Joel Selvin interviewed Paul Jackson, Moose Lethridge and myself for his article about The Uptones’ reformation in the 2000’s, we had no idea it would be part of a cover story in the Sunday Datebook. Shortly after the release of our Skankin’ Foolz Unite! CD, there it was next to the morning coffee and we were gobsmacked. Pat Johnson took the cover photo and Katy Raddatz got some fun color action shots of the band in rehearsal in West Oakland. You can read the saga in SFGate. Thanks Joel, and thanks everyone who has enjoyed this long, strange, ska trip with us.